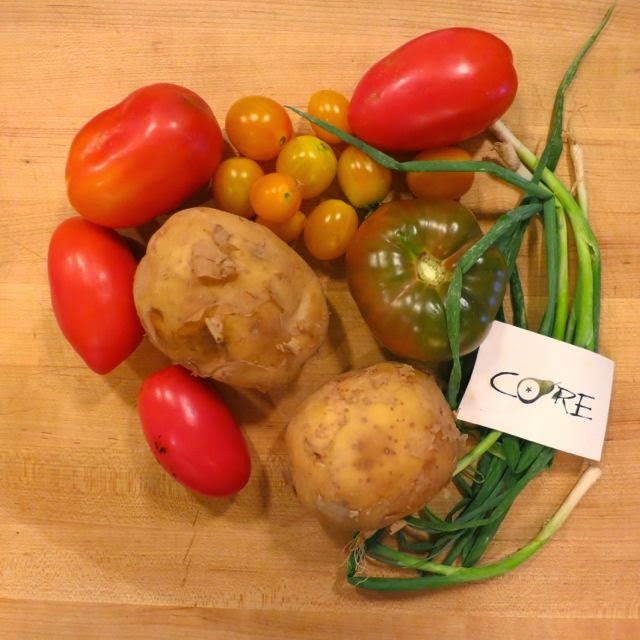 Last week, I attended a vegan pop-up put on by Christopher Roberson of Core Food Group. 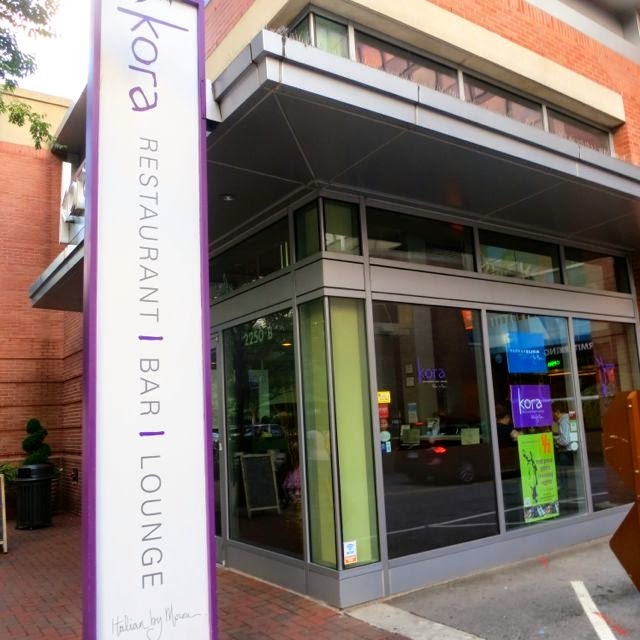 It was a 5-course meal held in a private room in Kora Restaurant in Arlington, Virginia. It wa as intriguing to me because I had never heard of this chef. Why was he holding a vegan pop-up, I wondered. So I caught up with him afterwards to get the scoop. Christopher Roberson has been working in the restaurant industry for more than ten years. He started in Baltimore as a banquet prep cook for a large hotel chain. Then, he moved to DC to follow a cook he looked up to and became the lead cook in the savory and pastry areas of Butterfield 9. After that, he worked under the now owner of Mintwood Place and Michael Richard of Central. He eventually made his way to Vidalia to further his pastry knowledge. So the real question was -- why a vegan pop-up? He said, "Veganism closely aligns with my core food philosophies. 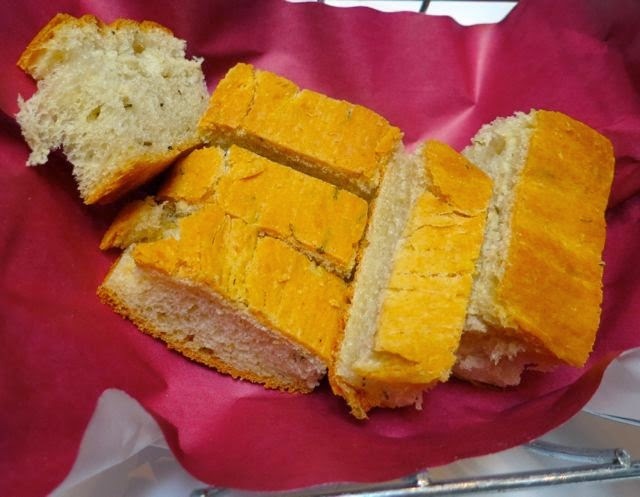 I'm passionate about local, environmentally sound food that has been produced as ethically as possible. I believe that connecting with the earth and the people who grow our food are critical to understanding the delicate relationship we have with the planet. I think that, ideally, food that we put into our bodies should reflect the world we want to live in and that means minimizing the harm involved -- from not exploiting animals, to treating our workers well, to not using produce that was picked by abused and vulnerable migrant workers." Well, he blew me away with that response. So, now you are wondering -- how was the dinner? The first course was Cream and Spinach. 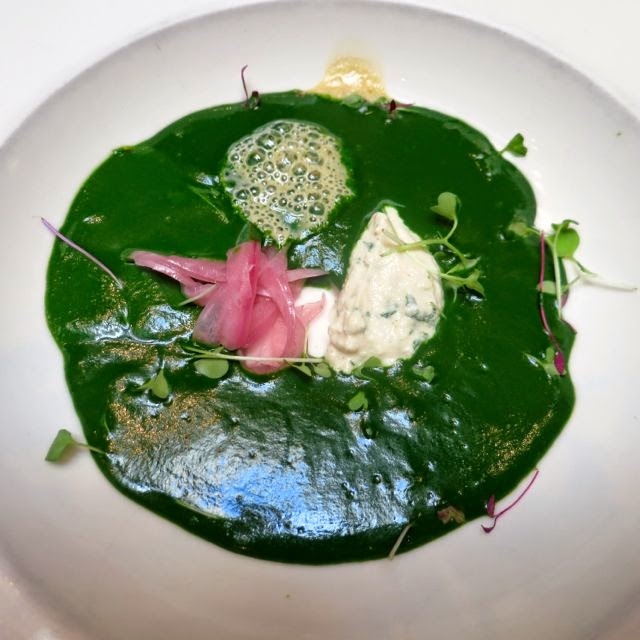 It was a soup made of baby spinach with pickled red onions and cheesy parmesan foam and a soy-based ricotta. I loved the thick ricotta, but thought the soup itself was way too thick. It was more like a spinach smoothie. I thought the ricotta and onions went well, but wasn't a big fan of the cheesy foam. The second course was Tomatoes and Potatoes. 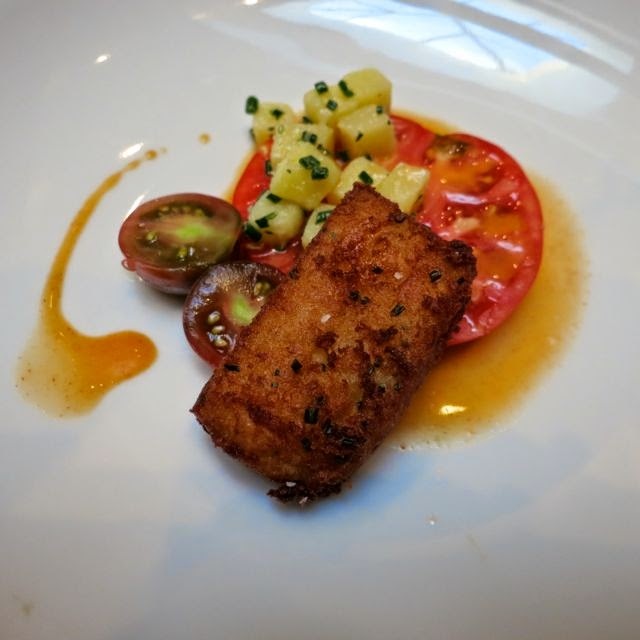 I liked the ripe heirloom tomatoes in the cider vinaigrette topped with yellow potatoes, but the hash brown-like fried potato seemed out of place in this dish. I also was caught off guard by the smoked flavor as he had smoked the tomatoes. It wasn't my favorite dish of the night. This is where it really started getting good. The third course was Peas and Carrots. 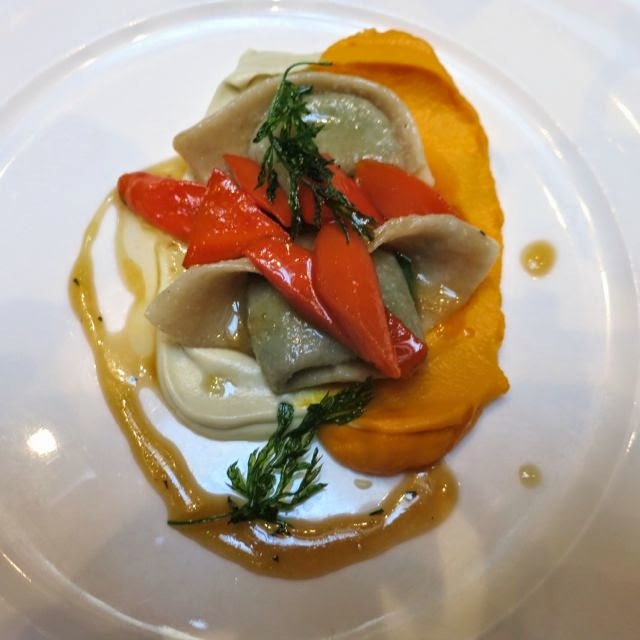 The first layer was this amazing artichoke puree alongside a carrot puree with housemade soft tortellini filled with a spiced pea mixture. It was terrific. On top were smoked maple glazed carrots that were a bit too smoky for me, but they went well with this dish. Next up was another of my favorites of the night -- Chicken and Everything. He took some of the premade chicken drumsticks and seared them until they had a crispy, crunchy outside -- it was lovely. 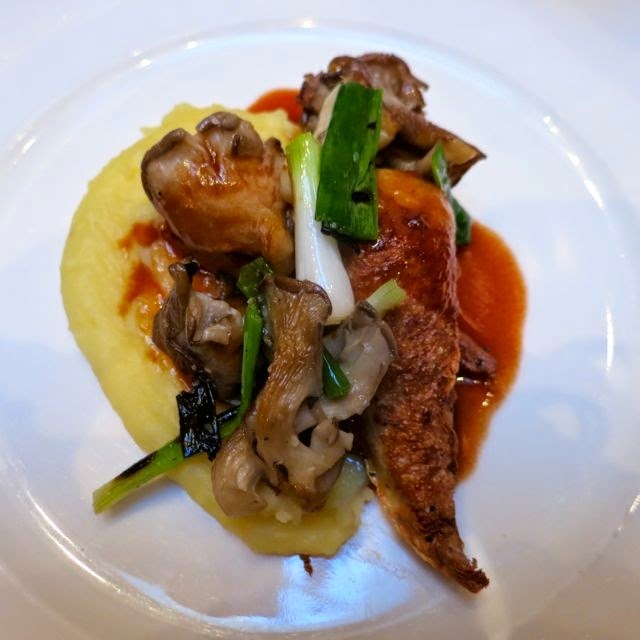 Served over a potato puree with roasted oyster mushrooms and finished with a cherry demi-glaze, this dish was spectacular. I wasn't expecting much of the dessert, which is where he really threw me a curveball. The Peaches and Herb course was also fantastic. 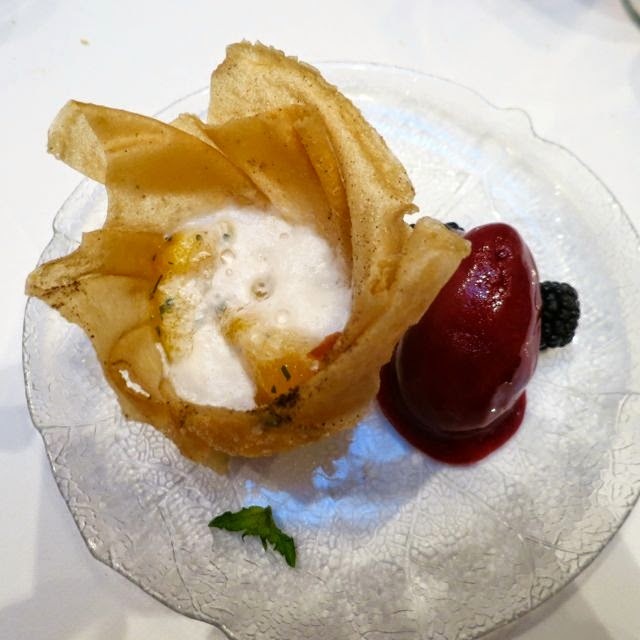 The pastry was filled with tarragon poached peaches and rose scented coconut cream and served with blackberry sorbet. It was really very well balanced and cooked just right. At the end of the dinner, he personally handed everyone a bag of produce from the farm he used to cook that night's meal. What a great way to end the night! So now that the pop-up is over, now what? Christopher hopes to open a vegan fine dining restaurant in DC, which is something our city needs desperately. And although I didn't love every dish, I liked aspects of every dish and was very fond of the last three. In fact, that tortellini was truly fantastic. I'm really looking forward to the next meal from Mr. Roberson. In the meantime, I'll just wait to see where his next dinner will be. Stay tuned. Full Disclosure: Although the meal was provided to me for free to review, that in no way influenced my veracious opinion.